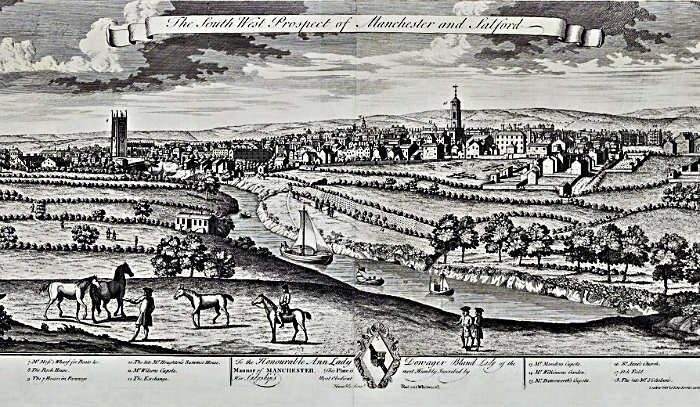 Print in 18th Century Manchester. Today we think of Manchester as the world’s first industrial city and a crucible of industrial revolution in the nineteenth century. But in the fifteenth century it was a prosperous market town on the banks of the Rivers Irwell and Irk. It had a manor house and a collegiate church (which became the cathedral in 1847) and there was an embryonic textile industry with Flemish weavers and cloth merchants attracted to the town. The domestic buildings associated with the collegiate church and the cathedral itself are all that remain of the medieval buildings of the town. During the Reformation the domestic buildings fell into disrepair and suffered further abuse and neglect during The English Civil War. The buildings were renovated during the seventeenth century by the gentleman-merchant Sir Humphrey Chetham, and in 1653 he founded Chetham’s Library, the oldest surviving public library in Great Britain, in the restored buildings. The first book printed in Manchester was John Jackson’s Mathematical lectures read to the Mathematical Society in Manchester, printed by Roger Adams in 1719.
via First Impressions | Manchester. Definition of a ‘Printing Office’ c 1890. In my experience the term “printing office” was quite a common term to describe a printing establishment, The Old Guv was known as the Government Printing Office and most of the other States of Australia used the same term, it was also used in the United Kingdom and United States. The 1897 Brit­ish Printer art­icle, below, sets out their thoughts on ‘Print­ing Office’ from that time. 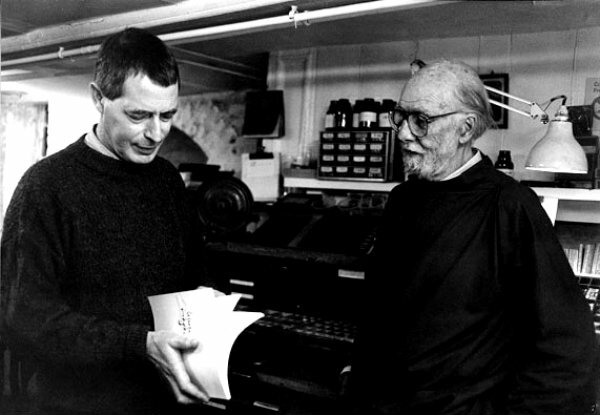 via The Printing “Office” | British Letterpress. To plane the type in letterpresss printing is to put a flat block of wood a PLANER, on top of the set hot metal type or foundry type on the imposition stone and tap it gently with a mallet. This to make sure that all the type is the same height prior to printing. Durer’s Drawing of a Printing Press, Nuremberg, c. 1511. Sketch by Albrecht Durer, 1511, probably drawn from memory. Tools shown on the cheek of the press are the same Y-shaped tool shown in the Ascensius press marks, and a pair of dividers. In the well-known 1628 copperplate engraving published in Haarlem by Peter Scriverius, the scissors, dividers and paste-brush are shown again on the head of the press. In this engraving, called “the first accurate representation of a press,” the mysterious tool of 1520 is not shown. A hammer or mallet is shown hanging from the left cheek of the press, used of course for planing the form and setting the quoins and sidesticks. Sidesticks were strips of wood or metal; when wedged against quoins, they secured one side of a locked-up page.